NASA officials answer questions during a news conference to discuss the findings of two reviews regarding astronaut medical and behavioral health assessments, at NASA Headquarters in Washington. NASA has launched an investigation into claims thatastronauts have flown despite appearing intoxicated based on a report by anindependent health panel, the space agency said Friday. "At this point, we're dealing with allegations and weneed to find out what the ground truth is," NASA associate administrator Shana Dale said in a press briefing. The investigation, as well as a new interim policypertaining to alcohol use by spaceflyers prior to launch, stem from thefindings of an independent review of NASA's astronaut health care system. The12-page report, along with an internal NASA review on the agency's behavioraland medical practices, was released Friday. U.S. Air Force Col. Richard Bachmann, Jr., a veteran flightsurgeon who chaired the independent panel, said his committee found atleast two instances in which a crewmember had reportedly drankheavily before flight. One involved astronauts flying aboard a NASA shuttleand T-38 aircraft, while the other relating to Russian Soyuz flight to theInternational Space Station, he said. In one of the accounts, Bachmann said, an astronaut reportedconcerns over a fellow spaceflyer's condition after ashuttle launch was delayed, when the orbiter crew was leaving NASA's Floridaspacewalk aboard on of the agency's T-38 training jets. But in both reports, hestressed, the astronauts or flight surgeons with concerns felt their input wasdisregarded, as the spaceflyers in question wereultimately allowed to fly. "We cannot say with any certainty whether they, in fact,were at all under the influence or affected at the time they flew,"Bachmann said of the astronauts in question, who were not named in the report,nor were the times, dates or specific missions of each account. "The issueof concern was that the medical advisors or the peers, who should be empoweredto raise questions, felt like they were not." Only about four paragraphs of the 12-page report weredevoted to alcohol use of astronauts before flight. Based on the recommendations from the two reports, Dale saidNASA plans to devise an official astronaut code of conduct, as well as includea behavioral assessment to the annual flight physicals of its spaceflyers. Theagency will also enhance the use of psychological evaluations for futureastronaut selections and strive to ensure that safety concerns can be raisedfreely, she added.?? 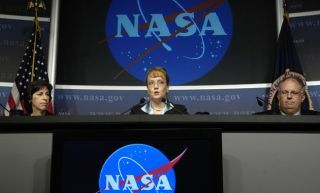 NASA launched both astronaut health reviews in the daysfollowing the Feb. 5 arrest of former NASAastronaut Lisa Nowak. Florida police officers arrested Nowak in a parkinglot at the Orlando International Airport after she allegedly attacked a womanthat authorities said she perceived as a romantic rival for the affections ofthen-space shuttle astronaut Williams Oefelein. Nowak has pleaded not guilty to charges of attemptedkidnapping, battery and burglary with assault. NASA dismissed bothNowak and Oefelein from their astronaut duties earlier this year. Dale and Ellen Ochoa, NASA's director of flight crewoperations, said an interim spaceflight policy that prohibits astronauts fromdrinking alcohol in the 12 hours before a launch is now in place. That policy,taken from the agency's standing regulations governing flights of its T-38training aircraft, was previously unofficially applied to human spaceflight,Ochoa said. Meanwhile, NASA safety and mission assurance chief BryanO'Conner has discussed the new policy with the commander and lead flight surgeon of the agency's next shuttle mission currently set for anAug. 7 launch , Dale said. In the week before launch, a shuttle astronaut crew entersquarantine to avoid developing sickness in flight. During that time, astronautswork through prelaunch activities, but their actions are not regulated duringtheir off-duty time. Alcoholic beverages are freely available at NASA'sastronaut crew quarters, NASA said. "They are really responsible adults," Dale said ofNASA's astronauts. "After they've finished their regular day of work, ifthey want to go back to crew quarters and have a beer I think that'sokay." In Kazakhstan, where U.S. astronauts and Russian cosmonautsenter quarantine for up to three weeks before launch from Baikonur Cosmodrome,there is a preflight ceremony with champagne though NASA officials said theycouldn't recall Americans actually drinking it. "For them it's a great tradition in theirsociety," Ochoa said of NASA's Russian counterparts, adding that it datesback to the first flight of cosmonaut Yuri Gagarin nearly 50 years ago. NASAwill talk with its spaceflyers to ensure the traditions of its Russian partnersare properly respected, Ochoa added. Former astronauts lamented that the report's anonymousanecdotes of astronaut drinking might tarnish the 26-year reputation of NASAand its shuttle flying astronaut corps. "It doesn?t fit with anything, anything that I?ve everseen or heard," said former astronaut Tom Jones, who flew on four shuttlemissions between 1994 and 2001. "I flew with about 20 people on four missionsand I never saw anybody with any kind of problem in the hours beforelaunch." Jones said that, based on his experience with NASA flightsurgeons and fellow astronauts, he finds it hard to believe that a spaceflyerwould be cleared for flight with a known performance deficit, especially in anera that has seen two shuttle disasters - Challenger in 1986 and Columbia in2003 - that ended in astronaut fatalities. "There's no upside to letting this guy get apass," Jones said. "This is where it all comes down to doing the joband doing it 100 percent effectively." Space News Staff Writer Brian Berger contributed to thisreport from Washington, D.C.